This Caperdonich was bottled for K&L in California by Hunter Hamilton under their Sovereign label. Hunter Hamilton in turn is one of the many Laing outfits, I believe. All the Caperdonichs I’ve had have been very old and from the halcyon period from the late 60s to the early 70s so I am curious to see what this middle-aged one from 1994 is like. You don’t really hear too much about Caperdonich from the 1980s and 1990s. And Caperdonich is really not a well-known name, in general, outside whisky geek circles. This bottle started out north of $100 at K&L and eventually got discounted down to the mid-$70s. Hard luck for those who bought it at the original price but so it goes, I suppose. Anyway, now that the distillery is closed down for good it might well be that there’s a lot of stock from its later period as well that might get to mature to a ripe old age as the older stock did through the 70s, 80s and 90s. The label does not specify but this is pretty obviously from an ex-bourbon cask. Nose: Toasted wood with some spicy overtones; apple and apple peels, a mild grassiness. Gets acidic after a bit with a touch of lime peel. So far, so blah. Should get better with water (I hope). With water the citrus gets much amplified and there’s also now greater vanilla, a cidery note and some pepper. Palate: Hmmm this is better than promised by the nose: malty sweetness and vanilla and some citrussy notes that verge on the musky. Apple here too but it’s baked/stewed apple. Hot but still quite drinkable at full strength with a soft texture after the initial bite. Okay, let’s add water. Yes, water tames the bite and brings the fruit out more strongly. The apple recedes and instead it’s a mix of citrus (lemon, kaffir lime plus peel) and honey. The malt and vanilla are still around too. With time the pepper intensifies, the baked apple returns and there’s more toasted wood now too. Finish: Surprisingly short. Water extends the finish with the malt and vanilla hanging on longest. A little bit of cocoa powder later and some hints of tropical fruit on the sides of my tongue well after the last swallow. Comments: Didn’t start out very promisingly on the nose, but time and water really made it much more interesting. I could see another 10-12 years in oak doing really wonderful stuff to this spirit. As it is, I think the discounted price is the right price for what this is–though I will be interested to come back to it later in the life of the bottle as well; I’m most intrigued to see if the teasing tropical fruit that develops late on the finish will intensify. Another 1990s Caperdonich up tomorrow, this one younger and heavily peated. 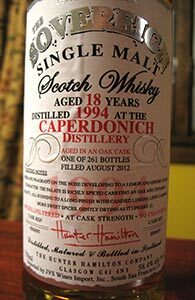 This entry was posted in -Whisky by Rating, 85-89 points, Caperdonich, Hunter Hamilton, K&L, Store Bottlings, Whisky by Bottler. Bookmark the permalink. I had a similar experience with this bottle, good and interesting, but a mild letdown. I’m happy I got it at the sale price. I’m surprised however you didn’t get any peat in there, I found the peaty notes rather striking! Nope, didn’t remark it at all. Will look again soon. No absence of peat in the Caperdonich coming up tomorrow though…. I poured this at our local group’s tasting last night. Three of the nine people present got mild notes of peat; I was not among them even though I tried very hard to find it after they mentioned it. I wonder if the note that’s triggering an over-ripe musky, melon receptor for most people might be triggering a gasoline/peat receptor for some others. I spent some quality time with this bottle a few nights ago. I like it a lot better than I used to! It’s getting better in the opened bottle, or it’s the kind of whisky that rewards your full attention, or both. The nose has all kinds of fruits – baked apples, quince compote – all very nicely integrated. (They were there in the beginning as well, but they were too muddled for me – now they ring nice and clear.) The peat appears in some earthy, musty notes in the background that anchor down this whisky. Very, very good, a high 3.5* for me. I’ve learned from a blogger that if you make a peated expression then some residual peat will appear in the unpeated expressions as well – I believe it was Ralfy or Oliver Klimek, discussing an unpeated Caol Ila. I don’t remember if it has to do with the kiln or with the still or the washback. But if they made peated Caperdonich, as the 1992 that you reviewed, then some peat may have rubbed off this Caperdonich as well. It’s all academic anyway, peat or no peat, this is a very good whisky! How did your local group like it? It did well enough–it was the second highest rated whisky of the night, behind the Port Charlotte An Turas Mor and just barely ahead of its peated 12 yo stablemate from Single Malts of Scotland. There was a bit of a spread though: 3/9 people had it as their top whisky and 2/9 had it as their least favourite. I think the not-so-unpeated Caol Ila unpeateds can be more easily put down to equipment not being cleaned properly between peated/unpeated runs because most of what Caol Ila makes is peated–and even with Caol Ila it’s only a couple of the unpeateds that have been mildly peaty. Caperdonich, as far as I know (which, frankly, is about as far as I could throw a particularly super-fatted hippopotamus) did not make much peated spirit so you’d think the odds of this happening would be lower. At any rate, my peated is from 1998, so from much later in the decade. Do you (or anyone else) know if Caperdonich was being asked to produce peated spirit for the group’s blends in the early-mid ’90s? My own theory remains that there’s some crossover note that says peat to some people and something else to other people. But the payoff is in Whisky Classified by David Wishart, 2006, p.92: “The distillery [Caperdonich] uses lightly peated malted barley”. Wishart mentions other distilleries using lightly peated barley, such as Glenrothes, Bunnahabhain or Fettercairn, but in other cases he specifies unpeated barley, e.g., Glen Elgin, Glendronach, Braeval. Aha. However, I would have assumed that almost all distilleries–with the exceptions of those like Glengoyne who trumpet their absolute lack of peat–use at least some barley that has been lightly/mildly peated. I wonder what the ppm rating is. Whoa, I’m late to this discussion. I’m a big fan of this whisky, especially because it keeps changing in the bottle. Sometimes it’s herbal, sometimes fruity, sometimes very malty. I’ve found a bit of peat, more like cinders and smoke than mossy veg. Had me wondering if it was a refill barrel that had previously held an Islay. Charlie MacLean’s Whiskypedia says that “a peaty variety” was “once made at the distillery” (p.107). But there’s no further info on it. I don’t know what the truth is, but there must be some resolution. I would generally trust Oliver’s knowledge far past mine, but in this case I can count twenty distilleries off the top of my head who release noticeably peated malt: Ardbeg, Ardmore, Arran, Benriach, Benromach, Bowmore, Bruichladdich, Bunnahabhain, Caol Ila, Clynelish, Edradour, Highland Park, Jura, Kilchoman, Kilkerran, Laphroaig, Lagavulin, Ledaig, Springbank and Talisker. And my sense, derived from reading I can’t call to mind, unfortunately, is that malt at other distilleries is often peated to a very light degree as well. Florin’s Wishart cite would seem to bear that out, as he names two others that I had not included in my list above. Perhaps Oliver means distilleries that use malt peated to Islay-like levels. I agree with MAO that Klimek must mean heavily-peated whiskies (of which there do seem to be about 15 or so). Another example of an “unpeated” malt would be The Balvenie, who use malt peated to about 5ppm in all of their expressions. For many of these products, peat smoke is used to season the product much like a chef uses salt to season food, even desserts. It just adds complexity. Yes, it’s in this sense that I meant that most distilleries, not just the ones on Islay, use peated malt (though I grant that “almost every distillery” may be an unwarranted exaggeration); they’re not palpably smoky whiskies but that doesn’t mean peat hasn’t gone anywhere near them. If that were true of so many distilleries then Glengoyne presumably would not make such a big marketing deal about the fact that they don’t use any peated malt. Glenmorangie and Glenfiddich had recent peated releases as well. There are some interesting conflicts here, like GlenDronach. And MacLean says Clynelish uses unpeated malt, though I side with MAO in having found peated notes in both OBs and indies. Also, Speyburn’s green label 10yo says it has peat notes. Including the ones referenced by MAO and Florin, that’s 40 (give or take a few) distilleries who have volunteered their peating information to published authors. Plus there are the random indie bottles with which some of us have sworn there’s some sort of peat element in the mix; for instance I had a Signatory Glencadam that definitely had peat on the palate. Because most distilleries try to protect some of mechanics behind their brands, I’m sure the actual final count of who-peats-what will remain foggy. But I wouldn’t be surprised if more than half of them have at least experimented with peated batches in their stills. Thanks for that. I’d concur with Maclean on Glendronach. Some other distilleries whose whiskies I (and others) have found light/mild peat/smoke notes in over the years include Mortlach, Dalmore, Balblair (the old 16 yo) and Glen Garioch (though I guess the distillations post the mid-1990s are sans peated malt). And Malt Madness reports that peated malt is made at Knockdhu as well though used only in blends. And I’m still not sure if when a distillery is reported as not using peated malt whether that means that there is absolutely no peated malt used or if the resulting whisky has minimal palpable peat influence in it. I’ve yet to find peat notes in GlenDronach but maybe I’ll have more luck with non-sherry bomb versions of it. And Balblair would be nice with some peat too. Since the SWA doesn’t require that phenolic data be printed on the bottles, I’m sure that many companies spin their peating information in whatever way they see fit. In MacLean’s case, he’s siting the malted barley material itself. He’ll say, “Unpeated malt from Roseisle”. I’ve heard from some sources that some distilleries’ water sources are lightly peated while the barley is unpeated, but I find it difficult to believe that the phenols in the water survive the violence of double distillation. Glengoyne is interesting though, being the one company that brags about its lack of peating. The anti-Octomore — one can always add PPMs, but one can’t have less than 0. It’s a play for the peat-phobes. I wonder if that approach actually works. I’ve not found phenolic notes in Glendronach, but I have found notes of wood smoke in some of their single casks. It may well be an earthy sherry or oak note, I suppose. To get back, more than a year later, to this bottle: I’m drinking it again tonight after a long, long time and I like it a lot more. Tonight it’s all honey and lemon peel and roasted malt. If I were reviewing it tonight I’d probably go up a couple of points. Like you, I’m getting back to my bottle since a great while. I get the honey, citrus, almost overwhelming sweetness when nosing neat–after letting it air out for 10-15 min. It’s a nice kind of sweetness that I can feel in the back of my nose, as it were, as much as I can taste. I got mine at the reduced ~$75 price; maybe ought to have picked up a couple. Shoulda woulda coulda. To my knowledge, Caperdonich only worked with “heavily” peated malt in 1997/98 (around 10 bottling are on the marked). I assume that Seagram, owning Caperdonich between 1977 and 2001, tried to get another profitable flavour profile from a distillery that wasn’t contributing well to the company’s blends any more. Trial and error, resulting in only two more bottlings available from Caperdonich distilled in 1999 (by G&M). Nothing after that.